Kailua is a great place to stay when visiting Oahu for folks looking for a "real" Hawaiian experience, enjoying the local life and just hanging out on beautiful beaches. Kailua beach and Lanikai beach (same area) are two of the nicest beaches in the world and not too many folks around which make it even nicer. 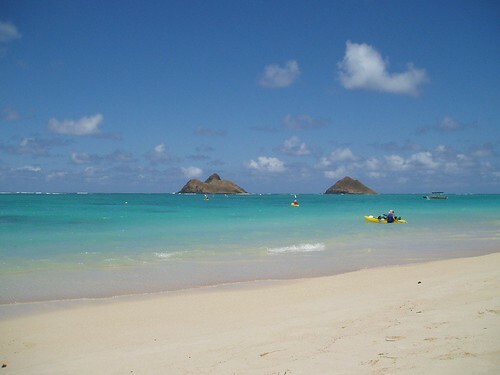 Lanikai and Kailua beaches: blue clear, relatively calm waters. Swimming areas and great views of the "Mokes" islands and flat island. Lots of activities like kayaking and windsurfing available. Not crowded at all. Surprisingly and happily very, very few people on the beach. Stop by Kalapawai for coffee and snacks before heading to the beach. Also check out Island Snow for shaved ice. Buzz's Steak and Seafood was surprisingly excellent. Ate there twice. Lanikai Juice for smoothies and their Acai bowl was also very good. Maladasas, or Portuguese donuts are excellent from Leonard's Bakery. Also, Boots and Kimo's for breakfast in Kailua was also yummy, banana pancakes w/ mac nut sauce is their specialty. Kailua's Thursday night Farmer's market was killer. We had our best dinner of the night there and got a pork lau lau plate for $9. We spent maybe $30 that whole day on food. Rachel Ray has nothing on me. Stay away from all the tourist traps especially Polynesian Cultural Center and their luau. Waikiki is cool for people watching but that's about it. There are better beaches out there. Sam Choy's restaurant (his flagship one) was pretty disappointing. Sam Choy is like the Emeril Lagasse of Oahu but Emeril's restaurants are actually pretty good. I wasn't impressed at all with the dinner we had. Wasabi cheesecake topped w/ Ahi poke, that would be a cheesecake w/ raw fish on top. Enough said. Used Kayak.com and Orbitz to shop around and we finally booked our flights directly w/ Hawaiian Airlines. Used Budget for car rental, and stayed at Papaya Paradise B&B (actually her daughter's place right next door – she also has vacation rentals) in Kailua. I don't believe there are any big hotels in Kailua, it's a relatively small town and not very touristy at all. We also went to Haunama Bay for snorkeling. It's a nice beach/location as well. The North shore also has some great beaches but not very swimmable. Waimea Bay is nice as is Sunset Beach. Weather wasn't the best in May, cloudy w/ intermittent showers. Another week or two and it would probably have been a little more perfect. We missed out on hiking Diamond Head this time and hanging out at North Shore beaches some more. I'd like to post my iTunes playlist too a la the celebrity ones at iTunes music store. It's actually a really cool way to discover new music. We wanted to do the same thing for Firefox, e.g. Celebrity Bookmarks. Ma.gnolia.com kinda already did it. I don't know how anyone can remember ma.gnolia.com. I can hardly remember where to put the periods for deli.cio.us (aka Backflip 2.0. I didn't use BackFlip either).